John Moyher, pharmacy clinical coordinator, and Dr. Jonathan Bankoff, chair of emergency medicine at Middlesex Hospital. Emergency department physicians across the state are using more non-opioid treatments for conditions that historically have required powerful opioids for pain management, as they try to play a lead role in the overdose epidemic that kills on average 115 Americans every day. This change, coupled with other efforts, has resulted in a significant decrease in opioids ordered at emergency departments in at least two Connecticut hospitals, Norwalk and Middlesex, from 2016 to 2017. Since 2001, when the Joint Commission first required health care providers to ask every patient about their pain, doctors have been compelled to aggressively treat pain for the comfort of their patients. As the scope of the opioid epidemic became known and deaths from drug overdoses soared, however, the medical establishment in the United States began to reconsider its practice of prescribing narcotics. The same pattern has occurred in Connecticut. This spring, the Connecticut Hospital Association, the Connecticut State Medical Society and the Connecticut chapter of the American College of Emergency Physicians endorsed an updated set of voluntary opioid prescribing guidelines in emergency departments. One of the new guidelines recommended that non-opioid therapies be administered or prescribed for ED patients whenever possible to minimize the use of opioids. The opioid prescribing guidelines were originally issued in 2015. Emergency department physicians at Norwalk and Middlesex have turned to non-opioid treatments, such as intravenous medications like Tylenol and lidocaine, an anesthetic — as well as consistently educating hospital staff and patients of the risks of opioids. Norwalk and Middlesex hospitals provided data to the Connecticut Mirror, while other hospitals declined a request for their opioid ordering rates. This information is tracked internally, and is not part of the required reporting to the state. At Norwalk Hospital, opioids were ordered in the emergency department 18,763 times in 2016. The following year, that number dropped to 13,590 — a 27 percent decrease. Each year, the emergency room has about 50,000 visits. 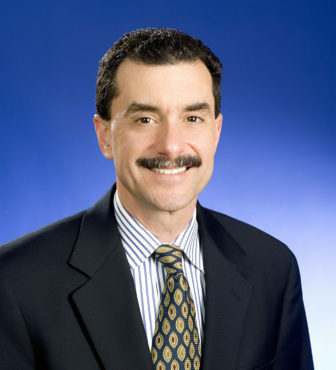 Dr. Christopher Michos, emergency department physician at Norwalk Hospital. This effort was led by Dr. Christopher Michos, who partnered with April Pegler, an emergency department nurse, and pharmacist Sam Strong, to bring down the hospital’s ordering rate. In Connecticut, overall drug deaths in the state have nearly tripled over six years, from 357 in 2012 to 1,038 in 2017, according to the Chief Medical Examiner’s office. “We’re facing a concern of newer and more potent narcotics on the street. With all of this information, we tried to look at our own opioid use in the department and to find some alternatives,” Michos said. In 2016, Michos visited St. Joseph’s Hospital in New Jersey, which has decreased its use of opioids. After that, Michos and the group continued their research and adopted new guidelines and protocols the following year, with the guidance of Dr. Benjamin Greenblatt, Norwalk’s chair of emergency medicine. For example, the emergency department’s protocols used to dictate that a patient with a kidney stone receive morphine or Dilaudid, both powerful opioids, as part of his or her pain management. The ED’s new protocols offer another option: intravenous lidocaine, a non-opioid, which has proven effective in pain management. Emergency department physicians at Norwalk Hospital also started performing ultrasound-guided nerve blocks for pain management in May 2017. Nerve blocks can provide pain relief from a number of injuries, including certain palm lacerations, and wrist, ankle and hip fractures. Sometimes anesthesiologists and orthopedic surgeons help administer the nerve blocks. Emergency department physicians at Middlesex Hospital have prioritized using alternative, non-opioid treatments for several years. Dr. Jonathan Bankoff, chair of emergency medicine, said his hospital started using intravenous Tylenol, which decreases hospital stays and complications, for hip fractures about five years ago. Bankoff said physicians continue to offer non-opioid alternatives whenever possible at the hospital’s three emergency departments in Middletown, Marlborough and Westbrook. They also order oral opioids first, rather than administering opioids by IV or through intramuscular administration. In 2016, opioids were ordered 9,756 times at the three sites. In 2017, that number dropped to 7,774 — about a 19 percent decrease. The three emergency department sites see an average of 87,000 visits annually. 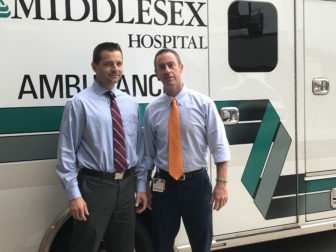 Bankoff said that since he started working at Middlesex 12 years ago, the emergency department’s management of kidney stones and migraines has historically included some component of opioid treatment. “A lot of kidney stone and migraine patients are chronic sufferers, and they end up in emergency departments quite often. We talk to patients, explaining why opiates are challenging to use in an acute environment and that the literature is not particularly supportive of opiates in managing migraines, for example,” he said. “It is difficult in the Emergency Department to break the cycle of using opioids in patients with chronic pain and opiate dependency. Patients have certain expectations, especially those patients with chronic pain. In addition to focusing on non-opioid alternatives, the voluntary ED opioid prescribing guidelines adopted by hospitals include several other recommendations aimed at reducing the inappropriate use of opioids. The guidelines lower the recommended dose of prescribed opioids from 30 pills to a three-day supply. This is more restrictive than state law, which limits opioid prescriptions to a seven-day supply for adults and a five-day supply for minors. They also remind providers that state law requires them to review a patient’s records in the Connecticut Prescription Drug Monitoring Program before prescribing more than a 72-hour supply of a controlled substance, and highlight the state requirement to inform patients about the risk and signs of addiction, as well as the dangers of drug interactions. The prescription drug monitoring program requires pharmacies to upload controlled substance prescriptions dispensed to patients, including opioids, but it does not require hospitals to upload controlled substances administered by its staff. “Connecticut hospitals recognize that providers have a responsibility to diagnose and treat pain, and they also have a responsibility to minimize the potential for the abuse of opioids,” Jennifer Jackson, CEO of the Connecticut Hospital Association, said in a statement. Data Editor Jake Kara contributed to this story.